I love startups, so when the publisher asked if I wanted to help him launch a liberal news and politics site, I jumped in. During my time as editor and writer at American News X, the site and Facebook page grew rapidly. We started with zero visitors and zero Facebook fans to over 600,000 page views per month and 350,000 Facebook followers in just one year. Managed busy newsroom with 10 writers and editors, plus contributors producing 10-15 posts a day. Produced, edited, curated, and shared engaging, relevant, accurate, and timely content on a network of 13 Facebook pages for a news and politics blog start-up with 600,000 page views per month. Ensured articles had strong titles, eye-catching images, compelling ledes and summaries, and high SEO scores. Oversaw major website upgrade with two coworkers, using the MH Magazine theme for WordPress and specialized plugins for SEO, social media, payments, advertising, responsive design, and customized visual elements. Created a writers’ guide and tutorial for editorial standards and requirements, styles (modified AP), sourcing and formatting images, SEO, and WordPress basics. Analyzed statistics from Google Analytics, AdSense, Facebook, and WordPress to increase traffic, rates per mille (RPM), engagement, and search rankings. We started out on a shoestring with a free WordPress theme and a fairly basic web account. But, less than one year later — with our traffic and Facebook engagement exploding — we needed to level up. For starters, we needed to migrate the entire site to a bigger and faster server. 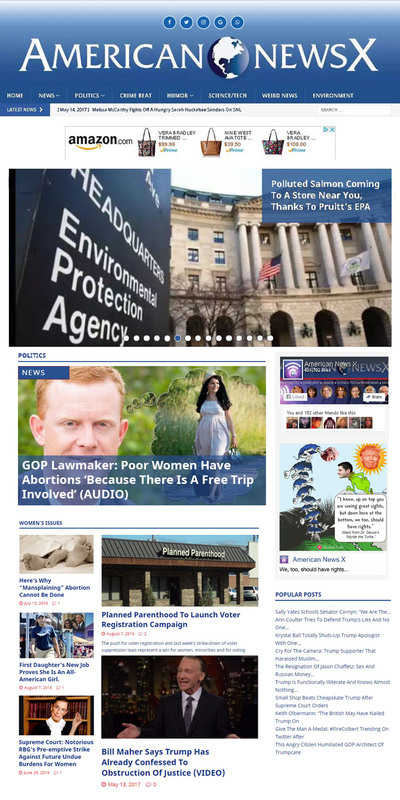 Because over 60 percent of our users browsed our site on their smartphones, we had to get more mobile-friendly. Since American News X also needed a cleaner and more user-friendly design we switched to MH Magazine, a more high-end theme. It took two weeks and two of my colleagues and me — plus a consultant — to do the revamp. Although it was a lot of work, we managed to do it fairly smoothly, with only minimal interruptions to our writers. Our new theme also played much more nicely with the WordPress plugins we needed for key functions on the site. These included: site optimization and backup, social media, Google analytics and ad networks like AdSense, Rev Content, and Taboola. We also installed and configured a new payment plugin for our writers. Payment were sent via PayPal and based on ad revenues for the articles we wrote). Here’s how the website and masthead originally looked. For starters, we needed to switch to from a free to a professional theme that could handle the heavy traffic we were getting and play nicely with the various plugins we needed to use. We also needed to lighten the dark background so the site would be more readable. Since Matt Silvan — a very talented graphic designer who also created memes — had already made a beautiful logo, we just had him make some adjustments to it. His new version of the American News X logo looked fantastic. I loved working with this eclectic crew of smart, creative, and fascinating people. Alas, the website no longer exists. As with many publishers, the 2017-2018 algorithm changes of the “Facebook Apocalypse” but you can see it in the Wayback Machine.